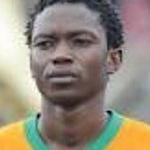 Rainford Kalaba is a Zambian professional footballer . Rainford Kalaba was born on the 14th of August 1986 in Kitwe, Zambia. In 2005, Rainford played for Kitwe United Football Club,then moved to Nice, France shortly and played for OGC Nice B from 2005 to 2006. Rainford returned to Zambia in 2006 and played for ZESCO United from 2006 to 2008. In the middle part of 2008,he moved on to Portugal to play for Sporting Braga F.C, for Gil Vincente F.C. on loan from 2008 to 2009 scoring four goals during his stay at the team and for Leiria F.C. on loan again in 2009 and scored one goal. He currently plays for Zamalek SC on loan from Sporting Braga of the Portuguese Liga,but also plays for TP Mazembe of the DRC.